Issues with Cam Release Mechanism of Magnetic Lifters - Armstrong Magnetics, Inc.
Any type of permanent magnetic lifters must have the capability of releasing workpieces underneath. There are two types of releasing mechanism available in the market. One type is rotating a handle from ON position to OFF position for the magnetic flux to circulate inside the lifting magnets, resulting zero magnetic attracting force to the workpiece below. Armstrong's NL-B series permanent lifting magnets adopt this design for releasing workload. 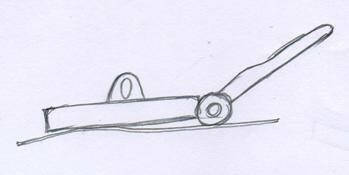 Another type of releasing mechanism uses a cam with a lever. Turning the lever can make one end of the lifting magnet elevated by a fraction of one inch from the steel plate surface, creating an air gap between the magnet and workpiece. However the air gap at the opposite end to the cam is still very small. 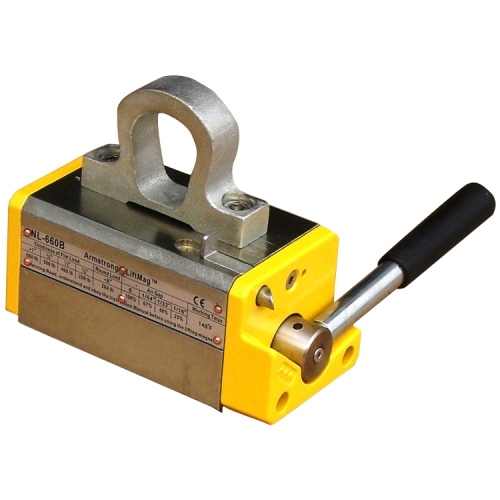 Our PL series lifting magnets have a slide block instead and a lever for releasing workpiece using the same working principle. Turn the handle to OFF position, so that the magnetic flux circulates inside the lifting magnet to release workpiece underneath. Lift the handle up, so that a cam or a slide block pushes the workpiece underneath away resulting an air gap to release the workpiece. There is no problem with releasing a steel plate thicker than 11 gauge (1/8”, 3.18mm). However, if the thickness of a sheet metal is less than 10 gauge, it could not be released entirely from the bottom of the lifting magnet. The cam or the slide block can push the sheet metal a fraction of one inch away from the magnetic poles, but the thin sheet metal would bend and remain attached to the magnetic poles at the other end of the cam. This can be a headache for operators to remove the thin sheet metals off of the lifting magnets. 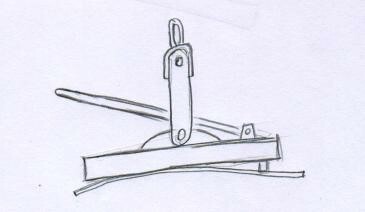 The following sketches show the thin sheet metals still cling to parts of the bottoms of the magnetic lifting devices after their levers are elevated. The lifting magnets with cam release mechanism have another problem. After the lever is turned and then the air gap between the lifting magnet and workpiece has been built, you must hold the lever in position to maintain the air gap until your crane completely hoists the lifting magnet away from the workpiece. Otherwise, the poles of the lifting magnet would return back to the workpiece. Currently we are in the research and development phase to resolve such problems mentioned above.